“This Hon’ble Court has emphasized and reiterated the need for ensuring and maintaining purity of highest legislative bodies. 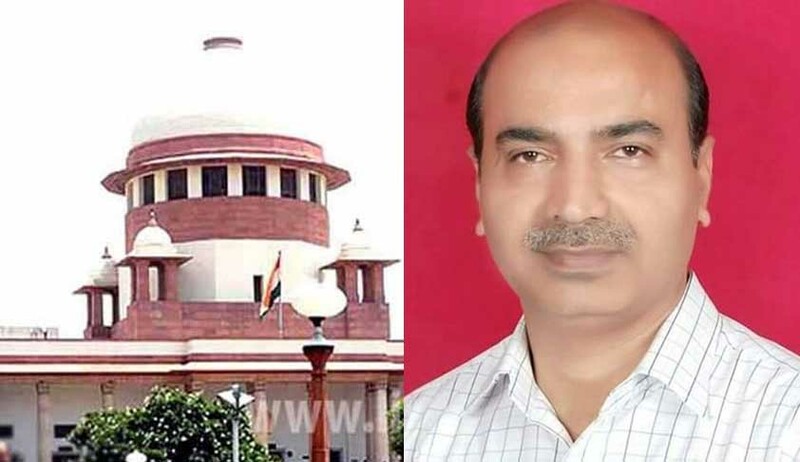 It is submitted that since the political parties choose candidates for these bodies, it is necessary that the persons controlling the party are themselves men/women of great character and integrity”, BJP leader and petitioner Ashwini Upadhyay to SC in his rejoinder. Questioning the stand adopted by the central government led by his party and fiercely opposing it, BJP leader and Supreme Court Ashwini Upadhyay has gone against his party line and reiterated that Supreme Court should ban convicted person- criminal or corrupt- from heading a political party. When its stand was sought by the bench headed by Chief Justice Dipak Misra, Centre had opposed the blanket ban on convicted politicians from heading political parties saying appointment of a post-holder in a political party is a matter of party autonomy and it may not be apt to preclude the Election Commission from registering a party merely because a particular post-holder is not qualified to contest elections. “Having regard to the existing provisions of law relating to registration of political part, there does not appear any connectivity and nexus between the situations debarring the persons disqualified under Representation of People’s Act and/or convicted under criminal law from contesting an election to parliament or state legislatures vis-a-vis debarring such persons from forming or becoming a member of any political party,” the government had added in its affidavit. But Upadhyay said in his rejoinder: This Hon’ble Court has emphasized and reiterated the need for ensuring and maintaining the purity of highest legislative bodies. It is submitted that since the political parties choose candidates for these bodies, it is necessary that the persons controlling the party are themselves men/women of great character and integrity. “Whatsoever a highly placed person does, the same is done by others as well. Whatever standards he sets, people follow. Therefore, it is imperative that our legislators, like Caesar’s wife, must be above suspicion. This is necessary because not only they make laws for governance but also, and more importantly because they control the entire administrative system”, he said. “The sharp deterioration in governance due to erosion of basic values of integrity, neutrality, and devotion to duty at all levels has been largely due to sharp fall in integrity and character of the ruling class over the years. The present day sad spectacle of even Central Ministers, Chief Ministers and top civil servants being sent to jail for corruption, and even judges of Superior Judiciary being accused of corruption, which was unheard of earlier, is the direct fall out of lacunae in our electoral system which permits the corrupt and criminals to grab political power. Unless this is checked, it is futile to expect any improvement in governance and administration. As pointed out by our Hon’ble outgoing President “If the Gangotri gets polluted, neither Ganga nor any of its tributaries can stay unpolluted”, said Upadhyay. Opening another front against the government, Upadhyay said “It is submitted that on the Government has failed to act on the proposal made in the CEC’s letter dated 15.7.1998 addressed to the Law Minister about strengthening of existing provisions regarding registration and deregistration of political parties, despite CEC’s subsequent letters dated 5.7.2004 to the Prime Minister and dated 4.12.2015 and 25.7.2016 to the Law Ministers and the recommendations of the NCRWC and the Law Commission 255th Report. “A man cannot directly contest an election, so he constitutes a group of persons to form a political party and contest an election. An association of people.. they can come together and start a school, a hospital but when it comes to the matters of governance that matters..its a question of electoral integrity”, the Chief Justice had said. “ A criminal deciding who the people should vote for by itself goes against the basic tenet of democracy”, he said adding allowing criminals to head parties and select candidates goes against its earlier judgments that the corrupt has to be ostracized for ensuring the purity of the electoral process.